(17) Being saved from the radiation of the weapon, the chaste Kuntî together with Draupadî and her sons addressed Krishna who was about to leave. (18) Kuntî said: 'My obeisances unto You, the Purusha, the invisible Original Controller of the Cosmos in the beyond, who exists both within and without all living beings. (19) Covered by the deluding [material] curtain, You, irreproachably transcendent, cannot be discerned by the foolish, just like an actor dressed up as a player. (20) But how can we women observe You, the object for the performance of bhakti of the advanced transcendentalists and philosophers who can discriminate between spirit and matter? (21) I therefore offer my respectful obeisances to You, Krishna, the Protector of the cows and the senses, the son of Vasudeva and Devakî, the child of Nanda and the cowherd men of Vrindâvana. (22) My respects for You, with a lotus-like depression in Your abdomen, always decorated with lotus flowers and with a glance as cool as a lotus flower, whose footprints show the mark of lotus flowers. (23) You, the master of the senses, have released Devakî [mother of Krishna] who was distressed because of being imprisoned for a long time by the envious [uncle] Kamsa and have also, as the guardian of me and my children, oh Mighty One, protected us against a series of dangers. (24) In the past saving us from poison, a great fire, man-eaters, a vicious assembly, sufferings from exile in the forest and against weapons in battles with great warriors, You have now fully protected us against the weapon of the son of Drona. (25) I wish there were more of those calamities, oh Master of the Universe, so that we could meet You again and again, for meeting You means that one no longer is confronted with a material existence. (26) Those increasingly under the influence of ambitions for a good birth, opulences, fame and beauty, will never ever deserve Your name on their lips, the name of You who can easily be approached by someone destitute. (27) All honor to You, the wealth of the ones living in poverty, You who stand for the freedom from the influence of the material qualities, You as the One satisfied within and most peaceful; I bow for You, the master of liberation and emancipation. (28) I consider You the personification of Eternal Time, the Lord without a beginning or an end, the All-pervasive One who distributes His mercy everywhere, equally, among the beings who live in mutual dissent. (29) Oh Lord, no one understands Your pastimes that appear to be as conflictual as the exploits of the common man. People think You are partial, but You favor or dislike no one. (30) Oh Soul of the Universe, even though You as the Soul are unborn and not active, You do take birth and engage in action, time and again in imitation of the animals, the human beings, the sages and the aquatics. (31) When the gopî [Yas'odâ, the cowherd foster mother of Krishna] took up a rope to bind You because You were naughty, You were afraid and cried the make-up off Your eyes, even though You are feared by fear in person. Such things bewilder me. (32) Some say that You, being born from the unborn like sandalwood appearing in the Malaya Hills, appeared in the family of dear King Yadu for the sake of the glory of the pious kings. (33) Others say that You took birth from the unborn, from Vasudeva and Devakî who prayed for You, in order to put an end to those who are jealous of the God-conscious souls. (34) Still others say that You, upon the prayers of Lord Brahmâ, have appeared like a boat on the sea, to take away the heavy burden of worldly grief. (35) And yet others say that You appeared for the souls who suffer from desire and nescience in the materially motivated world, so that they may engage in hearing, remembering and worshiping [You]. (36) Those people who take pleasure in continuously hearing, chanting and remembering Your activities, certainly very soon will see Your lotus feet, that put an end to the current of rebirths. (37) Oh Lord, with all that You did for us, You, departing now, leave us behind with the kings with whom we are engaged in enmity, we, Your intimate friends who depending on nothing but Your lotus feet owe their life to Your mercy. (38) Who are we, what is our fame and name, as Yadus together with the Pândavas, without You? With You absent we will be like the senses of a body abandoned by its controller. (39) Oh Gadâdhara ['wielder of the club'], the land of our kingdom will no longer appear as beautiful as it does now, being dazzled by the marks of Your footprints. (40) All these cities and towns, flourished, because of Your glances, more and more with their wealth of herbs, vegetables, forests, hills, rivers and seas. (41) Therefore, oh Lord and Soul of the Universe, oh Personality of the Universal Form, please sever this tie of the deep affection I have for my kinsmen, the Pândavas and the Vrishnis. (42) Make my attention for You, oh Lord of Madhu, pure and constant, may I be led by the direct attraction unto You, the way the Ganges is always flowing down to the sea. (43) Oh Krishna, friend of Arjuna and chief of the Vrishnis, annihilator of the rebellious dynasties on this earth, with Your unrelenting bravery You relieve the cows, the brahmins and the demigods in distress, oh Lord of Yoga incarnate, Universal Preceptor and Proprietor of All Wealth, I offer You my respectful obeisances.' "
Third revised edition, loaded February 17, 2016. Sûta said: "They [the Pândavas] together with Draupadî and the women put in front, went to the Ganges with the wish to perform the water duties for their relatives. After each had done his offering of water and sufficiently had mourned, they again took a bath in the water of the Ganges that is purified by the dust of the lotus feet of the Lord. Overwhelmed by grief the king of the Kurus [Yudhishthhira] sat there together with his younger brothers, Dhritarâshthra and Ghândârî, Kuntî, Draupadî and the Lord Himself. Because they cunningly had stolen the kingdom from Yudhishthhira [the eldest of the Pândavas] who had no enemies, the unscrupulous ones [Duryodhana and his brothers] had been killed who had shortened their lifespan with the insult of touching the hair of the queen [Draupadî]. By the proper performance of three excellent horse sacrifices his [Yudhishthhira's] fame spread in all directions like the fame of Indra who had performed that sacrifice a hundred times. Worshiped by both the brahmins and by Vyâsadeva and other sages, the Lord together with Uddhava [His friend and nephew] and Sâtyaki [his charioteer], [upon His departure] in response to their respects, invited the sons of Pându. Just as He wanted to leave for Dvârakâ, He, seated on His chariot, saw Uttarâ [the mother expecting Parîkchit] hurrying towards Him agitated by fear. She said: 'Protect me, protect me, oh Greatest of the Yogis, oh Worshiped of the Ones Worshiped and Lord of the Universe. Apart from You I see no one without fear in this world of death and duality. Oh all-powerful Lord, a fiery iron arrow is coming towards me. Let it burn me, oh Protector, but save my embryo!' "
Sûta said: "Considering her words the Supreme Lord, who is the caretaker of the devotees, understood that this was the result of a brahmâstra weapon of the son of Drona, who wanted to end the existence of all Pândava descendants. Oh chief of the munis [S'aunaka], seeing the glaring brahmâstra heading towards them, the Pândavas each took up their own five weapons. Seeing that they, with no other means available, were in great danger, the Almighty One took up His Sudars'ana disc for the protection of His devotees. From within the soul of all living beings, the Supreme Lord of Yoga, by means of His personal energy, shielded the embryo of Uttarâ in order to protect the progeny of the Kuru dynasty. Oh S'aunaka, even though the brahmâstra weapon cannot be stopped by counteractions, it was neutralized, being opposed by the strength of Vishnu. But do not regard all of this, with everything mysterious and infallible that we know of Him, as something special. The unseen godhead is of creation, maintenance and annihilation by means of the divine power of His material potency. Being saved from the radiation of the weapon, the chaste Kuntî together with Draupadî and her sons addressed Krishna who was about to leave. Kuntî said: 'My obeisances unto You, the Purusha, the invisible Original Controller of the Cosmos in the beyond, who exists both within and without all living beings. Covered by the deluding [material] curtain, You, irreproachably transcendent, cannot be discerned by the foolish, just like an actor dressed up as a player. But how can we women observe You, the object for the performance of bhakti of the advanced transcendentalists and philosophers who can discriminate between spirit and matter? I therefore offer my respectful obeisances to You, Krishna, the Protector of the cows and the senses, the son of Vasudeva and Devakî, the child of Nanda and the cowherd men of Vrindâvana. My respects for You, with a lotus-like depression in Your abdomen, always decorated with lotus flowers and with a glance as cool as a lotus flower, whose footprints show the mark of lotus flowers. You, the master of the senses, have released Devakî [mother of Krishna] who was distressed because of being imprisoned for a long time by the envious [uncle] Kamsa and have also, as the guardian of me and my children, oh Mighty One, protected us against a series of dangers. In the past saving us from poison, a great fire, man-eaters, a vicious assembly, sufferings from exile in the forest and against weapons in battles with great warriors, You have now fully protected us against the weapon of the son of Drona. I wish there were more of those calamities, oh Master of the Universe, so that we could meet You again and again, for meeting You means that one no longer is confronted with a material existence. Those increasingly under the influence of ambitions for a good birth, opulences, fame and beauty, will never ever deserve Your name on their lips, the name of You who can easily be approached by someone destitute. All honor to You, the wealth of the ones living in poverty, You who stand for the freedom from the influence of the material qualities, You as the One satisfied within and most peaceful; I bow for You, the master of liberation and emancipation. Oh Lord, no one understands Your pastimes that appear to be as conflictual as the exploits of the common man. People think You are partial, but You favor or dislike no one. Oh Soul of the Universe, even though You as the Soul are unborn and not active, You do take birth and engage in action, time and again in imitation of the animals, the human beings, the sages and the aquatics. When the gopî [Yas'odâ, the cowherd foster mother of Krishna] took up a rope to bind You because You were naughty, You were afraid and cried the make-up off Your eyes, even though You are feared by fear in person. Such things bewilder me. Some say that You, being born from the unborn like sandalwood appearing in the Malaya Hills, appeared in the family of dear King Yadu for the sake of the glory of the pious kings. Others say that You took birth from the unborn, from Vasudeva and Devakî who prayed for You, in order to put an end to those who are jealous of the God-conscious souls. Still others say that You, upon the prayers of Lord Brahmâ, have appeared like a boat on the sea, to take away the heavy burden of worldly grief. And yet others say that You appeared for the souls who suffer from desire and nescience in the materially motivated world, so that they may engage in hearing, remembering and worshiping [You]. Those people who take pleasure in continuously hearing, chanting and remembering Your activities, certainly very soon will see Your lotus feet, that put an end to the current of rebirths. Oh Lord, with all that You did for us, You, departing now, leave us behind with the kings with whom we are engaged in enmity, we, Your intimate friends who depending on nothing but Your lotus feet owe their life to Your mercy. Who are we, what is our fame and name as Yadus together with the Pândavas, without You? With You absent we will be like the senses of a body abandoned by its controller. Oh Gadâdhara ['wielder of the club'], the land of our kingdom will no longer appear as beautiful as it does now, being dazzled by the marks of Your footprints. All these cities and towns, flourished, because of Your glances, more and more with their wealth of herbs, vegetables, forests, hills, rivers and seas. Therefore, oh Lord and Soul of the Universe, oh Personality of the Universal Form, please sever this tie of the deep affection I have for my kinsmen, the Pândavas and the Vrishnis. Make my attention for You, oh Lord of Madhu, pure and constant, may I be led by the direct attraction unto You, the way the Ganges is always flowing down to the sea. Oh Krishna, friend of Arjuna and chief of the Vrishnis, annihilator of the rebellious dynasties on this earth, with Your unrelenting bravery You relieve the cows, the brahmins and the demigods in distress, oh Lord of Yoga incarnate, Universal Preceptor and Proprietor of All Wealth, I offer You my respectful obeisances.' "
Sûta said: "After with this choice of words of queen Kuntî having been worshiped in His universal glories, the Lord gave a mild smile that was as captivating as His mystic power. Thus accepting that, He entered the palace of Hastinâpura and informed the other ladies [about His departure]. But upon leaving for His own residence, He was lovingly stopped by [Yudhishthhira] the king. 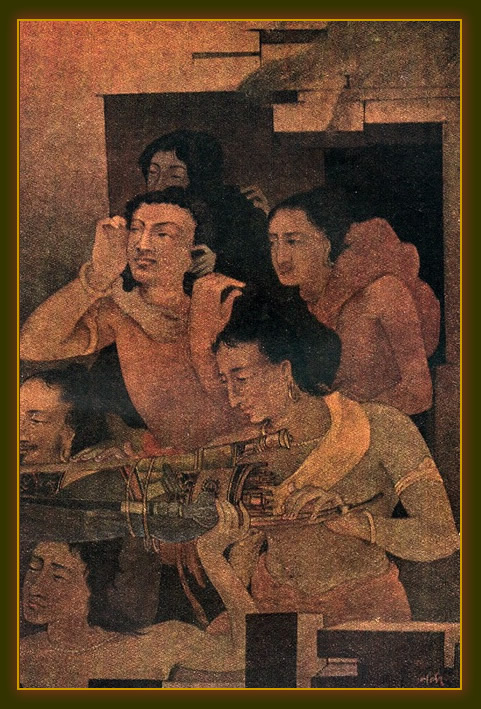 The scholars, the sages headed by Vyâsa and Krishna Himself - nota bene the one of superhuman accomplishment - , could not convince the king, who was distressed, nor could he find any solace in the classical stories. 'Oh, just look at me who, from the ignorance in his heart, got immersed in sin when he, with this body, which is meant to serve others, killed so many formations of warriors. I who have killed so many boys, twice-born souls, well-wishers, friends, elders, brothers and teachers, surely never ever, not even for a million years, shall be freed from hell. It is not a sin for a king to kill when he fights his enemies for the just cause of protecting his people, but those words, instituted to satisfy the administration, do not apply to me. All the enmity that accumulated among the women of the friends I have killed, I cannot expect to be undone by engaging myself for the sake of their material welfare. Just like one cannot filter mud with the help of mud or clear wine stains by using wine, one neither can counteract the killing of a single life with the performance of sacrifices.' "
leaving the house of lac set afire by the Kauravas is of Nanda Lâl Bose.